The spirit, or immaterial part of man, as distinct from the body or material part; the seat of feeling, thought, and moral action. 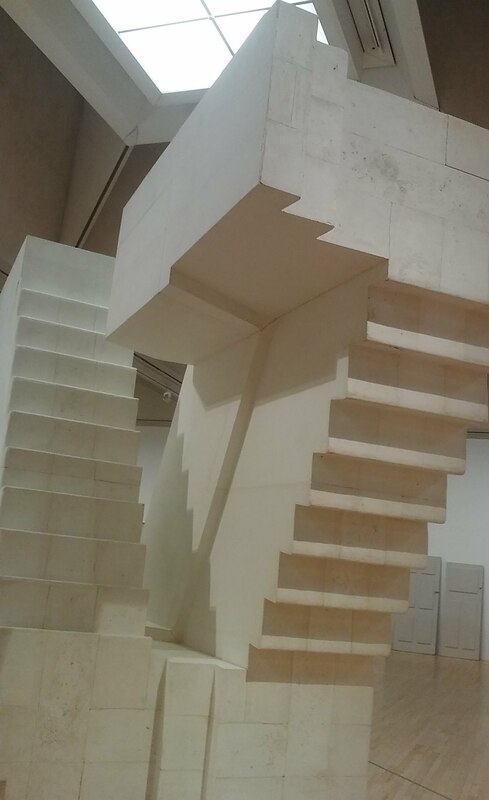 Whiteread’s sculptures are of what’s not there – the immaterial. They resemble reality, without representing it. The line is blurred between the negative space and the positive reality. It can be confusing, at times, to understand what her work shows. The floors look like floors, they could act as floors, but they’re not floors. If you’re familiar with the Platonic idea of Forms, it sort of reminded me of a subversion of that. They are not objects of obvious moral dimension, but Whiteread does tend to make sculptures of things we should not lose. 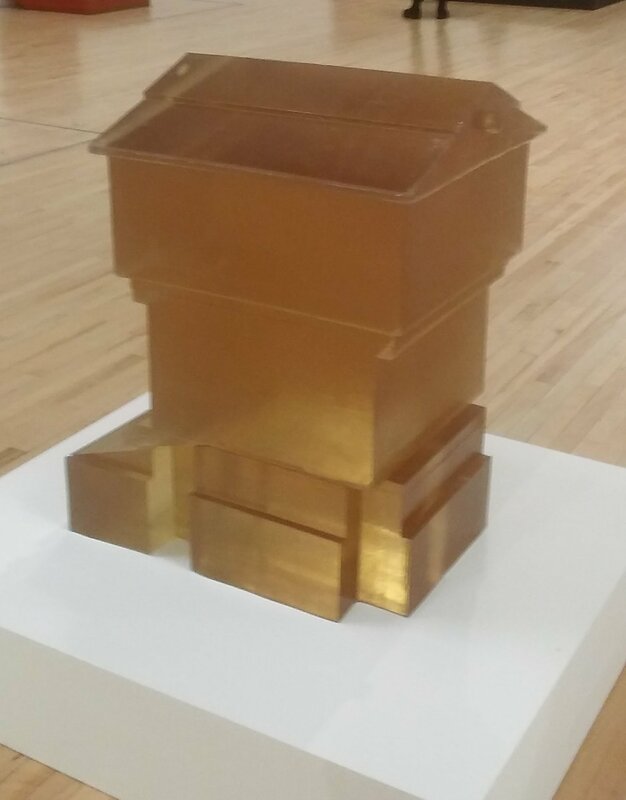 Beehives. Books. Flower boxes. Windows to the outside world. Shells of objects, to which you cannot help but impart your own feelings and associations. Filling the space around what was draws attention to the present lack of said object. This carries with it a level of wistfulness. Who had been sitting on the tables and chairs, of which only impressions remain? What books lined those library shelves? This is an image which she also co-opts in her Vienna-based Holocaust memorial, with good reason – it’s a powerful symbol of the lives, the potential, that was lost. Then there’s her torsos – a jarring name for what are, in fact, hot water bottles, but still an uneasy reminder of our own impermanence in contrast to their solidity. The houses which made her name are mostly here in photographs. Good photographs, with angles to show their relevance in situ. How they stand as an almost spectral presence of the past, how they make you think about why they’re not actually there. Installing a Shack in the gardens of Westminster is inspired. Can you tell I rather enjoyed the show? Do you know, Rachel Whiteread is one of those artists I’ve always been aware of, and thought I knew. But coming to see this show – a pretty comprehensive retrospective of her career – and I realised that I didn’t at all. Not having come into contact with one of her creations face-to-face, I’d never stopped to consider the weight of emotion it would carry. With a whole range of subjects explored here, their collective symbolism is haunting. I will say; this is an expensive show. The most expensive show I’ve ever reviewed on Messy Lines (I could only visit so close to Christmas myself because I had a gift voucher) But I often consider the value of art to lie in its emotional impact. And these spectres of objects will be staying with me for quite some time. This entry was posted in Exhibitions, Home, On my travels and tagged art, culture, London, sculpture. Bookmark the permalink. ← Sugar, spice and what’s not nice.